How Much Suffering Will the Iranian People Endure? News agencies around the world profiled the plight of Maedeh Hojabri, a 19-year-old girl who does what comes naturally for most teenagers around the world. She likes to dance and often posts clips of her moves to Instagram, drawing a following of 600,000 followers. In the U.S., she would probably be hit up by companies wanting her to endorse her products online and maybe even start up a YouTube channel. Unfortunately for Maedeh, she lives in Iran where the mullahs seem to be obsessed with tossing anyone in prison who exhibits any form of creative or artistic freedom, especially if they are female. 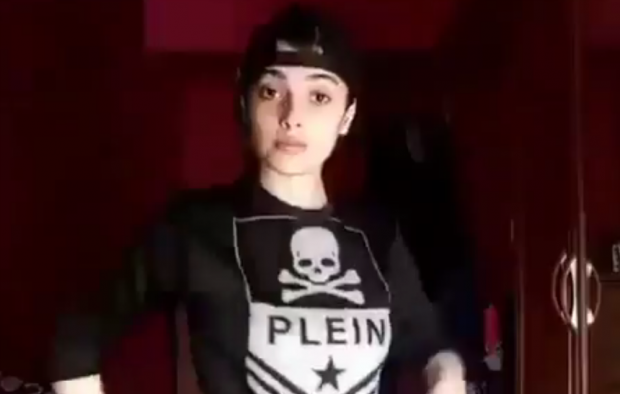 She had been quietly arrested by regime officials last May, but her whereabouts only recently became known to her followers when fans recognized a blurry image of her on a regime-supported television show that showed her crying and admitting that dancing was a crime. We’re sure the mullahs thought public shaming of a teenager was a recipe for success in their small, twisted, warped minds, but instead the incident had the opposite effect as it galvanized the Iranian people into more of a frenzy of protest over the regime’s ongoing corruption, unemployment, and faltering economy. Predictably, none of that seems to make a difference to the mullahs who seem to be hellbent on alienating almost the entire population of Iran with even more strong-arm, militant tactics, including the announcement that Shaparak Shajarizadeh, the woman who removed her headscarf in protest last February was sentenced to two-years in prison and 18 years of probation. With all of the new inflamed reaction being spread across Instagram, the regime now is contemplating banning Instagram the same as it banned Telegram, the instant-messaging app that the overwhelming majority of Iranians use to communicate. The mullahs blamed Telegram for being used as a tool of dissidents to organize protests, as well as the launch of its own cyber currency which threatened to derail an already floundering rial. The reaction from Iranians to Maedeh’s forced confession on Twitter ranged from indignant to outraged as reported by the New York Times. All of which raises the question of just how much suffering is the Iranian people to take before they force regime change on their own? The question is not so far-fetched now in the wake of widespread, deep-rooted and pervasive dissent that has manifested itself in protests all over Iran, including the virtual shutdown of the famed Grand Bazaar marketplace in Tehran. Those series of protests were so concerning that the Iran lobby pitched in to discount the symbolic importance of the bazaar with an editorial by Arshin Adib-Moghaddam, a University of London professor, in the Conversation and later in The Independent. “Once again, Iranians are articulating very specific demands related to the economy. But this is a part of the reform process in the country and not a revolutionary movement. The strike of the bazaari is the latest manifestation of the political prowess of an immensely potent civil society in Iran. And it is exactly because of this ability to organize and articulate their specific demands that Iranians have repeatedly managed to garner concessions from successive governments in their country – in many ways against all odds,” he writes in one of the more idiotic statements we’ve seen. To claim that the Iranian people are able to wring concessions from successive regime governments is ludicrous in light of the crackdown on civil liberties such as the arrest of dancing teenagers and banning of social media. If anything, the opposite is happening in Iran as the mullahs seem to grow more and more desperate to stamp out any sign of dissent, even possibly sanctioning a terrorist plot to bomb a gathering of Iranian dissidents in Paris that was foiled by authorities. Out of the 507 individuals executed in Iran last year, “501 were men and six were women. At least five juvenile offenders were executed and 31 executions were carried out publicly. It’s stunning to think the Iranian regime is literally a world leader in executing its own citizens and yet those same citizens are taking to the streets, sharing on banned social media and voicing their dissent in a myriad of ways knowing that such expressions of discontent could punch their ticket to Evin prison and the gallows. It is against all of this that the Iran lobby, especially the National Iranian American Council, remains stonily silent even though it purportedly speaks on behalf of civil liberties.